Weekend is right here and we have got something interesting for you. If you are planning to go for a party, a trip or just laze around the entire day, we suggest you to drop the idea. Well! The reason is this new amazing workout equipment known as XCos. Celebrity trainer, Namrata Purohit recently posted a video with Kareena Kapoor Khan working out with this new equipment which appears very similar to dumbbells. The gorgeous actress puts in a lot of effort when it comes to her workout. 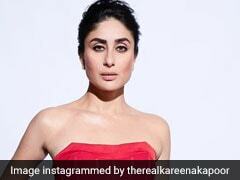 Kareena Kapoor Khan is a fitness enthusiast and makes sure that her workouts do not become mundane. Perfectly toned body, healthy body weight and constant glow on her face are no doubt because of the strenuous workout sessions that Kareena swears by. In this recently-uploaded video, the actress can be seen pushing her limits doing aerobic exercises with XCos tool. The XCos workout is an extraordinary, intense and dynamic workout which works on your entire body. Training with this equipment can be much more effective than a conventional weight training. This training tool is simple and suitable for every body type. Intensity of exercises done with this equipment can be controlled by the individual. In this workout, the special emphasis is given to your core and arms. Although XCos looks like dumbbells but they are a different tool. This tool was initially developed as an equipment to reduce risks of injury during full-body workouts among athletes. Apparently, one can exercise with the tool while running or jogging as well! The workout with XCOs involves training with muscles, ligaments, joints, connective tissue and nerve fibers.